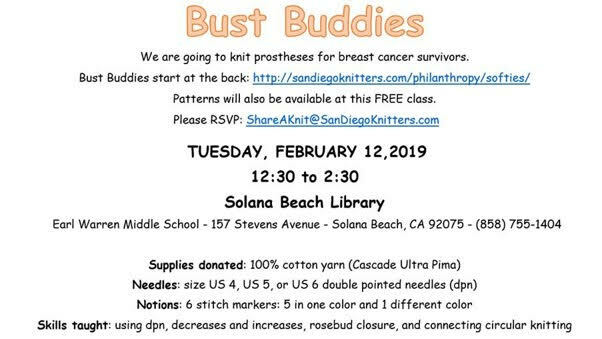 Eileen Adler is hosting a free Bust Buddies class Tuesday, February 12 at the Solana Beach Library from 12:30 to 2:30; just bring your dpn* needles in size US 4, 5, or 6 – the yarn will be supplied – and 6 stitch markers: 5 in one color and 1 different color. (*DPN’s – double pointed needles.) We can use donations of fiberfill and support with yarn supplies. The pattern is on the guild web site, bring a copy with you. Download a copy of Eileen’s Soft Solutions knitted breast prosthesis pattern here. Materials to bring: one set of double-pointed needles (sizes US 4, 5, or 6), 6 stitch marker – 5 in one color and 1 different color, a large eye yarn darning needle, and a printed copy of Eileen’s Soft Solutions Pattern. See the Bust Buddies and Softies page under the Philanthropy tab for more information. PARKING at the Solana Beach Library: Please park in the lower parking lot to leave the upper parking lot space available for the short-term visitors and physically-handicapped library patrons.